This is your last chance to nominate for the 2018/2019 Halewood Employee Excellence Awards. The nomination window closes on Friday 30 November so there is still time to have your all-important say. We’ve even included a nomination form on the next page to make it even easier for you! Do you know a team or individual who has gone above and beyond to make a real difference to life at Halewood? Then we are calling on you to ‘rate your mate’ so they can get the recognition they deserve. We also have more award categories this year, which are based on our scorecard priorities and the Customer First principles, so there are plenty of reasons to nominate. Remember these are the people’s awards, they are for everyone and we need your support to make them bigger and better than ever. To nominate, complete the yellow form on the next page and post into the red boxes at the People’s Centres, or apply online at www.bit.ly/HalewoodExcellence. But don’t just take our word for it… PTM caught up with our 2017/18 Employee of the Year, Carl Pollock about handing over his Excellence Awards crown. Carl said: “I’m really excited to see the line-up for the awards and am confident there will be a great mix of candidates. 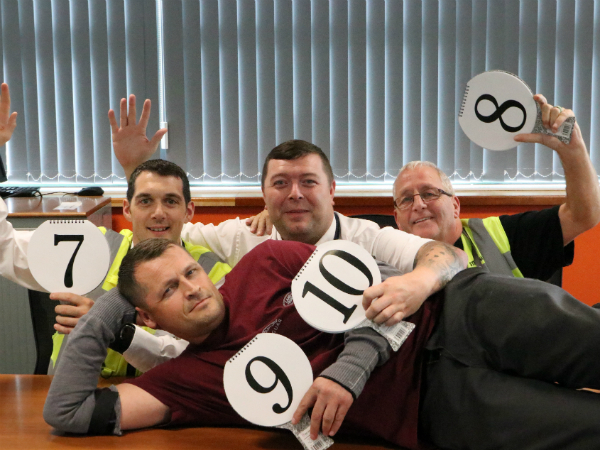 “There are so many people who do a fantastic job at Halewood so it’s important that we get behind the awards and nominate those who go the extra mile to improve our business. Asked how life has changed since winning Employee of the Year, Carl said: “Winning an Excellence Award has opened up so many different doors for me. I’ve been promoted from associate and now work as an audit engineer in the Supplier Parts Quality team- so it’s really helped to advance my career and boost my personal profile here.